The team is ready for Greece! Incredible. Amazing. Life-changing. These are all words I’ve used to describe my recent missions trip to Greece with a team of 18 other CrossBridge Church members, but to be honest, these simple words don’t seem adequate to fully capture the experience we had in Athens. For seven days, our team got a front row seat to what God was doing in Greece. From the ministry center, to Mars Hill, to the the streets of Athens, we saw God move in the lives of not only the Greeks and refugees, but in our own hearts as well. The Voice of Truth emblem on the window at the center. At Voice of Truth, our team was able to minister to refugees coming from Pakistan, Iran and other middle eastern countries. Some of them came on foot—a journey that could take anywhere from 30 days to several months—while others came on a raft designed for 20 people, but filled with more than 50 men, women and children. Our team helped prepare meals and serve food to the refugees, as well as cleared plates and washed dishes. We also helped clean and organize their children’s area, in addition to watching children during services. The refugees fell across the spectrum of faith. Some were Muslim, while others were recent converts to Christianity and many had come to Greece seeking freedom from religious persecution. 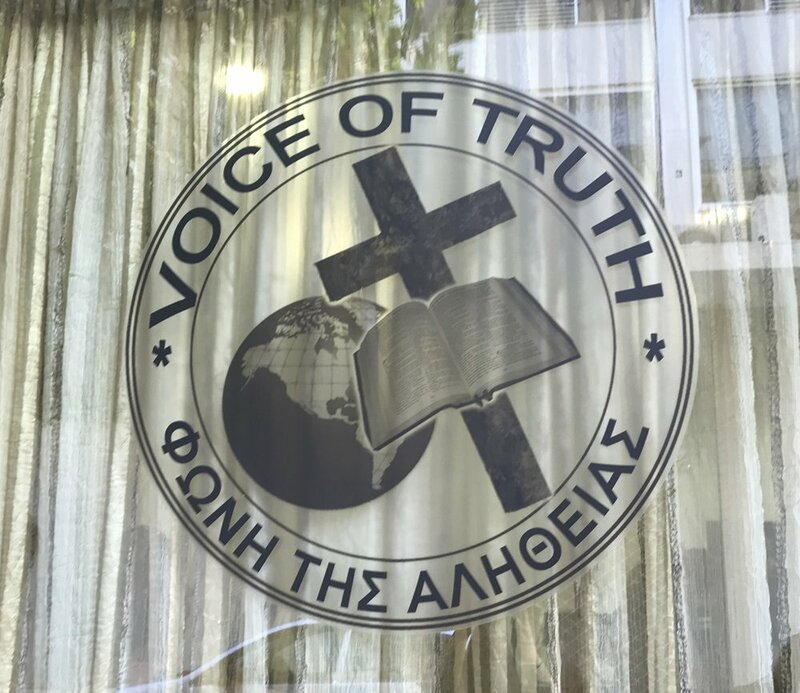 Each week, Voice of Truth offers services in Persian, Arabic and Greek/English, as well as a “Seeker’s Class.” These men and women spent hours seeking the word of God, sitting in service after service, day after day, to learn more about who God really is. Siamak, a refugee from Iran, served as both a translator and teacher at the center. 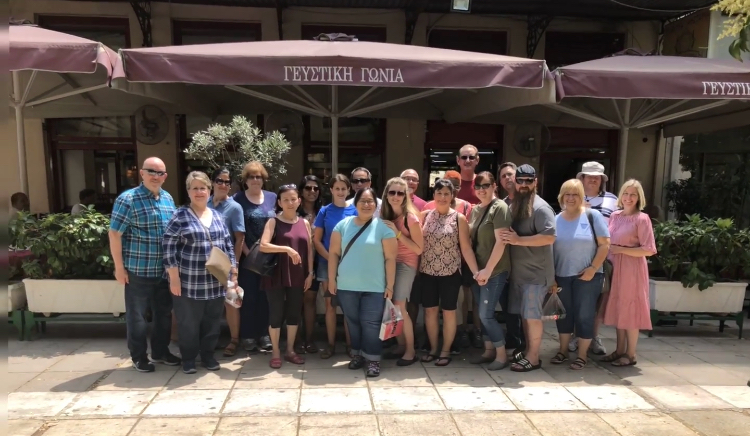 “My biggest takeaway from our trip to Greece was the salvation of the nine Persian men, 10 Persians baptized and to see the joy and happiness on Pastor Nate’s face when he was teaching these men and women. That brought a lot of joy to my heart,” said Pastor Terry, who taught at the Persian outreach. Through the help of translators, Pastor Nate was able to lead the seeker’s class, as well as a men’s Bible study, while Kim lead a women’s Bible study on joy. Jimmy Ablaza was also able to preach the Word during Sunday’s Greek/English service, which brought congregants from all over the world, including Greece, Iran, Pakistan, China, the Philippines and, of course, America. Siamak helps translate the message of salvation to seeking Muslims, after a Seekers Class taught by Pastor Nate. Though we didn’t always speak the same language, our team was able to experience rich fellowship with the people we met at Voice of Truth. That includes the Filipino small group, which welcomed us in like family during a fellowship at James and Christina Sinde’s home, as well as with the staff of Voice of Truth, who displayed a Christ-like love for each one of us. While the refugees we spent time with often didn’t have much—leaving comfortable lives, families, and everything they’ve ever known to move to an unknown country—they welcomed us with open arms and extreme generosity, living examples of joy and contentment. Our time with them put into perspective what was of utmost importance—not comfort, not things, not even a safe place to lay your head at night; but pursuing Jesus wholeheartedly and making Him known. And though our team is now almost 5,000 miles away from Voice of Truth, the people and lessons we learned still weigh heavy in our hearts and minds.